Why were the Mascarenes islands, La Réunion and Mauritius (and Rodrigues), uninhabited until Europeans arrived ? Many islands off the coast of Africa remained uninhabited until the arrival of Europeans, because, as I understand it, they weren't close enough to be seen from the mainland and the people on the mainland weren't good navigators. However, the closest land to La Réunion and Mauritius was Madagascar, which was settled by Austronesians, that is, perhaps the best seafarers of their time. It seems a little strange that they haven't colonized these islands as well, especially since, unlike the desolate islands of Mozambique channel, they have freshwater, and, at the time, abundant game. Indeed, they are far less desolate than the Chathams, that are at about the same distance from New Zealand as La Réunion from Madagascar, and which the Maori did settle. They don't seem to have been prevented from doing so by the prevailing winds either. Also, it is said on Wikipedia that both islands were known to Arab traders before the arrival of Europeans. Now in their case, if they were traders who travelled along the coast, it makes a bit more sense that they wouldn't have cared given their remoteness from the trade routes. Still, it seems that they didn't even set foot on the islands to check whether they were worth something. The map (not great but the best I could find online) from this wikipedia article might provide an explanation. The two little dots to the East of the cost of Madagascar are the La Réunion and Mauritius islands. 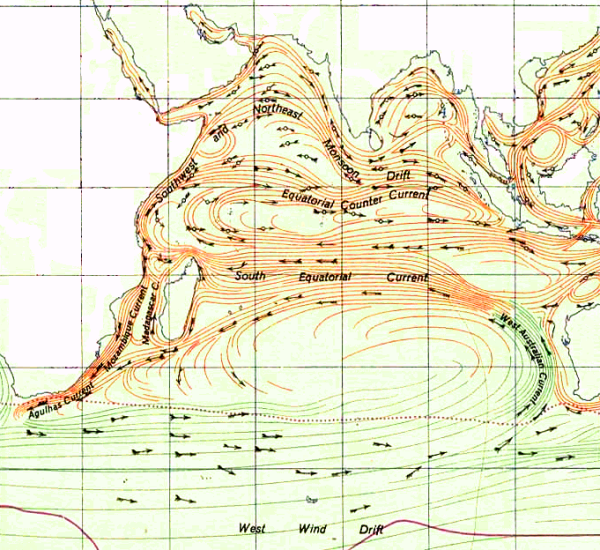 The South Indian Ocean stream splits before reaching the islands and makes an accidental discovery less likely. Compare this with the streams (West Australian current becoming the South Equatorial current) going straight into the coast of Madagascar. Not the answer you're looking for? Browse other questions tagged africa madagascar or ask your own question. Why did Kabila discard the name and flag of Zaire? What were the trade routes between Mapungubwe and other civilizations?